Reduce the impact of amblyopia (presently 1 in 30) and other conditions such as astigmatism, AMD that may lead to impairments and/or loss of sight, or affect a child’s spatial and cognitive development, through early identification. Through InfantSEE®, Optometrists in Athens provide a one-time, comprehensive eye and vision assessment to babies in their first year of life, usually between the ages of 6 and 12 months, offering early detection of potential eye and vision problems at no cost regardless of income or ability to pay. Parents may learn more about the importance of infant vision care and the InfantSEE® program by logging on to www.infantsee.org. 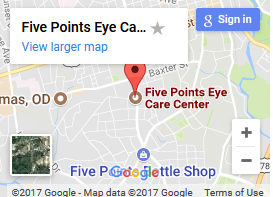 Please call Five Points Eye Care to schedule your baby’s InfantSEE® assessment.